LVL is 2.0E (min. ); solid sawn lumber is #2 or better. Anchor bolts are not included in the portal frame system kit. Refer to pages 5–7 for additional information on anchorage. Refer to foundation details for minimum concrete dimensions. Solid sawn columns require a wood shim at the holdown assemblies. The Strong-Wall site-built portal frame system (PFS) is applicable for use up to a height of 10' max. The height is permitted to be increased to 12' with a 2' max. pony wall. Allowable wall-bracing length must be multiplied by a 0.80 factor. Applicable for use in Wind and SDC A, B and C for detached one- and two-family dwellings. Use limited to single-story and the first of two-story applications. Concurrent vertical load denotes the total maximum concentric vertical load permitted on the panel acting in combination with the lateral wind loading. The Designer is responsible for the beam design. The reaction at beam/column interface shall not exceed the tabulated maximum allowable beam end reaction for each material type. Minimum header depths for LVL and solid sawn are 11 7/8" and 11 1/4" respectively. Solid sawn columns may be used in combination with LVL header material. Wall-bracing length is limited to that of the solid sawn material. 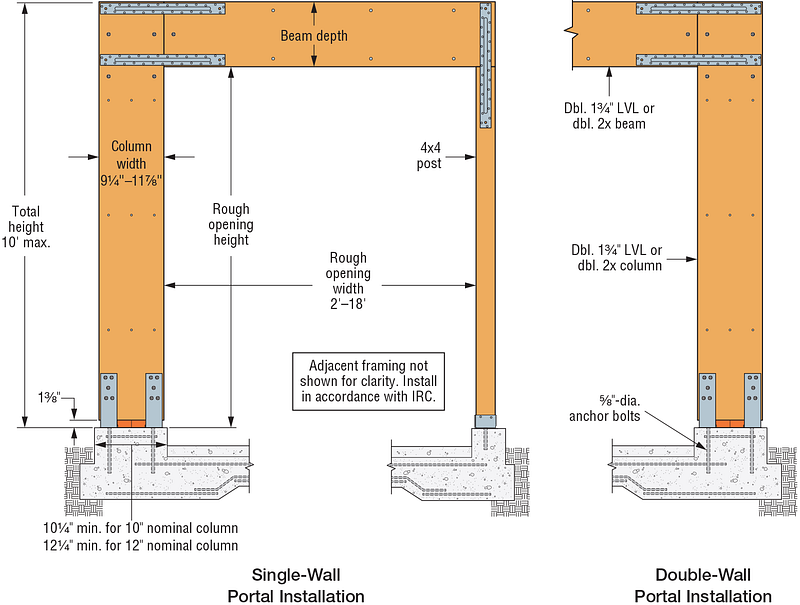 Shims illustrated in LVL — Solid Sawn detail below must be used for proper framing alignment. For 10" nominal DF/SP and SPF/HF systems constructed with shim at holdown only, vertical load is limited to 2,500 lb.